There are some creatures, however, for whom blue blood is the norm. 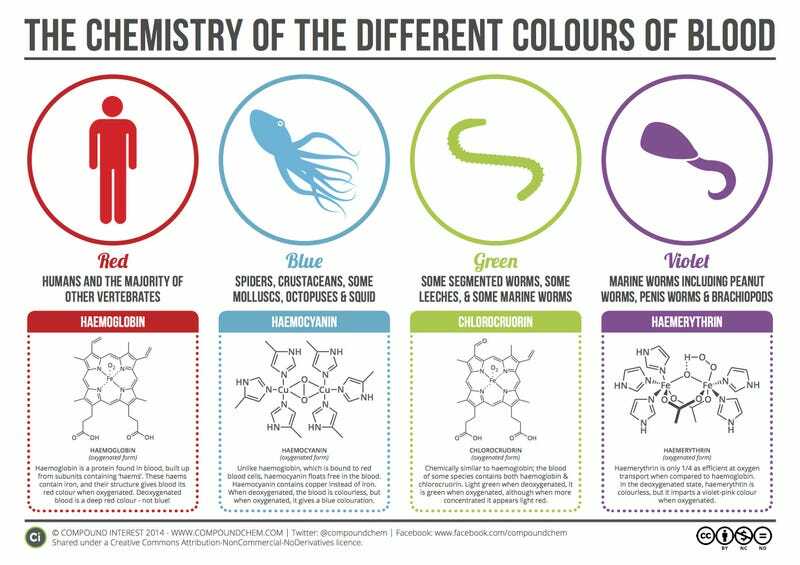 Crustaceans, spiders, squid, octopuses, and some molluscs all have blue blood as a result of having a different respiratory pigment. Rather than haemoglobin, these creatures use a protein called haemocyanin to transport oxygen. The differing structure of the pigment, as well as the incorporation of copper atoms instead of iron, leads to the blood being colourless when deoxygenated, and blue when oxygenated. They also bind to oxygen in a different manner to haemoglobin, with two copper atoms binding to each oxygen molecule. It doesn't stop there; green blood, too, is possible, in some species of worms and leeches. This is an interesting one, in that the individual units of chlorocruorin, the protein leading to a green blood colouration, are actually very similar in appearance to haemoglobin. In fact, they're near identical – the only different is an aldehyde group in the place of a vinyl group in the chemical structure (although the name might suggest otherwise, chlorocruorin doesn't contain any chlorine atoms). You can read more over on Compound Interest.